IDC Select® supplies deep groove ball bearings and mounted ball bearing units engineered to your specifications, in the quantities you need, when you need them. With worldwide manufacturing partners, we can help decrease production costs, increase efficiencies, and get the best possible price without the pitfalls that come with purchasing bearings globally. Contact your local Authorized IDC Select® Distributor for pricing and availability. IDC Select® carries a wide array of roller chain suitable for nearly any application. IDC Select® roller chain is manufactured to ANSI standards with wide waist link plates and offers a solid bushing solid roller design for smoother, longer running applications. Our chain is available in standard and conveyor series roller chain with nickel plated, stainless steel and attachment chain options. Click the cover to view the catalog. IDC Select® motors are manufactured in a state of the art production facility. Our line of three-phase AC motors are designed to both EPACT and Premium energy-efficiency mandates. They meet the energy efficiency requirements of the United States and Canada for general-purpose industrial motors. Our “General Purpose” design means these motors are suitable for a wide variety of applications. They are available in cast iron, rolled steel, stainless steel, farm duty, single-phase, and three-phase designs. IDC Select® Idlers and Tensioners are high quality products that meet or exceed Tier 1 quality standards. Our wide variety of products includes pulleys, bushings, sprockets, idler shafts and miscellaneous tensioning products. Our precision idlers and tensioners use only bearings from name brand manufacturers such as NTN, NSK, Nachi, IKO and Timken to ensure the best experience for you. IDC Select® also provides thermoplastic idler pulleys, which are precision molded glass-reinforced nylon idlers. These idlers are available in a wide range of styles and sizes. IDC Select® offers economical, made in the USA, 200 & 300 PSI general purpose and 300 PSI non-conductive multipurpose hose. Our general purpose hose has an EPDM synthetic rubber tube and cover. Our non-conductive hose comes with a nitrile blend synthetic rubber RMA class A tube and a nitrile blend synthetic rubber RMA class B cover. Shaft Collars function as locators, stops, bearing faces, spacers and to mount components in mechanical assemblies. Set Screw Collars and Clamp Collars can be used to limit the travel of a shaft in reciprocating applications, or used as a spacer between components. Utilized on shafts, tubing, pipe and split hubs in rotary and non-rotary applications. 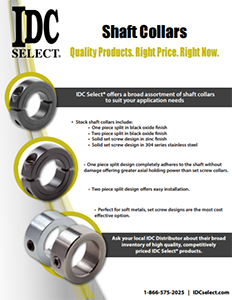 IDC Select® offers in stock, for immediate delivery, both fully keyed and plain shafts with common diameters. Our shafting is available in a large variety of types and steel grades. Special non-standard keyways and custom machining are available on request. IDC Select® supplies a full range of high-quality A/B Combination, C, 3V, 5V, 8V, Variable Pitch, and Light Duty Sheaves; QD®, Split Taper and Taper-Lock® Bushings; and Stock Bore, QD®, Taper-Lock® and HTD Timing Pulleys. Each sheave is precision machined from gray cast iron, statically balanced, painted with baked enamel finish and individually packaged. You can replace keyways, key stock, bushings and/or setscrews using an IDC Select® keyless locking device. For even greater cost savings, use keyless locking devices for applications requiring long keyways, splined shafts, threads, grooves and steps. IDC Select® offers a diverse line of mounted and unmounted bearings, bushings, chain, hose, shafting, sheaves, sprockets and other power transmission components. IDC Select® is the same high quality form and function to the brand name products you already buy, at a great value.